Rick Wakeman (ex-Yes) releases his latest work, which is a live album that was recorded in 2003 during the tour to promote the back then current studio album “Out There”. The album is entitled “In the Nick of Time” because just a few hours before the first concert the vocalist decided to step down and the first show turned into an instrumental concert! Luckily, his old time buddies from the New English Rock Ensemble band (Ashley Holt on vocals, Ant Glynne on guitars, Lee Pomeroy on bass & Tony Fernandez on drums)… stepped in at the last minute and the tour was saved. The album contains 7 songs taken from Rick’s several solo works… except for the last one “Wurm”, which is originally found on “The Yes” album as part of “Starship Trooper” track. The other 6 songs are: “Catherine Parr/Beware Your Enemies” from the album “The Six Wives of Henry VIII” in 1973, which is one of Rick’s best albums of all time and essential for lovers of prog/art rock 70s music… “Out There” from the homonymous album in 2003, “No Earthly Connection” (actually the tracks “The Spaceman” & “The Realisation”) from the self-titled album in 1976, “Dance Of A Thousand Lights” from “Return to the Centre of the Earth” in 2009, “The Cathedral In The Sky” from “Out There” in 2003 & “White Rock” from the homonymous album in 1977. For the first time In The Nick Of Time-Live In 2003 is now available on CD. Rick Wakeman and The New English Rock Ensemble recorded the album in the U.K on the Out There tour in 2003. The band featured Ashley Holt (vocals), Tony Fernandez (drums), Ant Glynne (guitar) and Lee Pomeroy (bass). Rick Wakeman remains one of the most recognized and admired keyboard players in the world. I can count on one hand who I think are the best and this gent is right at the top with greats like Jordan Rudess. Of course he made his mark long before people like Rudess so that needs to be taken into consideration. He goes back a long way. For over 40 years now he has been entertaining audiences with his tremendous talent and humorous storytelling. If you ever get a chance to pick up one of his solo gigs on DVD make a point to do so. You will discover a Wakeman you never knew before. This archived recording is exceptional. While I appreciated Ashley Holt’s most appropriate vocals for the music it is the keyboard sprints throughout this live performance that captivated me. There is something about Rick’s playing that separates him from everyone else. There are many reasons for that however there are two things that really make his music shine, his natural talent and who he is as a person. All of that comes flowing through the music like an erupting volcano and it is captured quite well on this CD. The curtain raises and sets the stage for the entire performance with ”Catherine Parr / Beware Your Enemies.” It is a superb opening montage. “The Cathedral In The Sky” conjures images of space travel and beyond and brings the title Out There into proper perspective. Wakeman’s music is very visual so words are never a necessity to paint the picture he desires. Some of the guitar playing I could really appreciate as well. Ant Glynne is not a recognizable name but trust me he is more than adequate and surely Wakeman knows who has what it takes to play his music. “White Rock” and “Wurm,” which serves as the grand finale, put the bass and the guitar in the spotlight quite nicely so you can really appreciate more than just the spectacular keys from Mr. Wakeman. I am sure many folks have been waiting for this recording to surface for some time now. Gonzo Multimedia from the UK always does a nice job representing artists and puts out some quality packages. Is this a must have for prog heads, Yes and Wakeman fans? I would answer that with a resounding thumbs up. STYLE Progressive rock electronica.In The Nick Of Time is a live album recorded back in 2003 that showcases some of the outstanding solo material composed over the decades by keyboard legend Rick Wakeman. Supported by The New English Rock Ensemble, Rick's music here takes on a massive live rock character. The drums are thunderous, the lead breaks (both from Rick on synths and Ant Glynnes on guitar) are masterful and grandiose, the vocals are those of dramatic rock opera epics and even bassist Lee Pomeroy gets to dazzle during a blinding spotlight section of the concluding Wurm. The heaving progressive pomp and unashamedly extravagant arrangements give the music a dynamic enormity firmly rooted back in the seventies. ARTWORK In The Nick Of Time is a jewelcase presentation with a generous twenty page booklet included. The Front cover sets a galactic tone that is expanded throughout the package with effulgent red orange nebulae vomiting out stars, planets and snaking keyboard ribbons. Rick's image hangs in the void to one side of the titles semi-transparent. Track titles are listed with times on the rear along with publishing information. The booklet opens with a five page section "Rick's Attempt at a Definition" wherein Rick explains the title of the album; thoughts on prog; something of his personal history: a bit of a rant about Yes and The Rock and Roll Hall of Fame and plenty of thoughts on the development of the man's music. There are numerous live performance photographs, posters, biographies of the band and a whole page of credits and thank yous. OVERALL Rick Wakeman is surely one of the most well known keyboardists alive - his work with various rock and pop giants (David Bowie, Marc Bolan and Yes) as well as some huge early solo releases (The Six Wives of Henry VIII, Journey To The Centre Of The Earth ...) establishing a loyal following that would remain for decades. In The Nick Of Time is an archival live recording that sees the maestro in fine form back in 2003 promoting the Out There album. Tracks include developments of favourite solo compositions such Catherine Parr/Beware Your Enemies and White Rock; pieces written for vocals such as No Earthly Connection; a reimagining of the Yes classic Wurm as well as pieces from the then newly released Out There album of 2003. For more information you can visit the official Rick Wakeman website or you can purchase the album directly from the Gonzo Multimedia website. Spaced out but not out there, another marvelous crusade of the Caped Wizard. If the myriad of Rick Wakeman's studio works requires a guide for the uninitiated to not be playing a hit-or-miss game, the keyboardist's live recordings are always listener's gain. So while 2003's "Out There" is a quirky concept confection, on the road its excerpts lent themselves to a context which mixed time-tested classics with a newer material. Choosing from his vast catalogue never was a challenge for Rick, what with his improvisational bent, yet the situation Wakeman started that UK tour in was. Shortly before the first gig Damian Wilson, who sang on the album, vanished and, although a purely instrumental performance didn't pose a problem, the piano man called his choice voice Ashley Holt to step forward as he did many times before and supplant the suppleness of his predecessor with refined muscularity. Hence the title of this CD, a document of their heroics. Both veterans are in their dramatic element on "No Earthly Connection" here, yet the main thread during those concerts was cosmic-centered - not for nothing Wakeman reimagined Steve Howe's "Wurm" and gave much string reins to Ant Glynne - so two fresh cuts, grand rockers "Out There" and the choir-enhanced "Cathedral In The Sky", provide a lot of space for the guitarist to fly. He does just that on the opener "Catherine Parr" that is expanded with the unreleased "Beware Your Enemies" where synthesizers take over from the organ, before drummer Tony Fernandez and bassist Lee Pomeroy give rhythms an impressive weight to which Holt's heavy lungs contribute nicely. Much lighter fares their groove on the slinky "White Rock" and "The Dance Of A Thousand Lights", led by Rick's elegant piano and faux orchestra and quoting the original "Journey". Such curious selection of tracks makes this album very interesting but the ensemble's delivery turns it into a celebration of sound. Ah yes, there's also liner notes penned by the wiz himself whose raconteur skills are on par with his playing. Let's make it a good tradition, Rick, writing notes, OK? If there is a central image of prog rock’s excesses, it is likely the cape-sporting Yes man Rick Wakeman surrounded by a semi-circle of towering keyboards. But strip away at the pomp, the pageantry and, yeah, the cape, and there remains just as much musical brilliance, something you’re reminded of all over again with this never-before-released live date from 2003 with the New English Rock Ensemble. At times, In the Nick of Time has an almost unquenchable propulsion, as Wakeman works in furious bursts of creativity — moving from classically inspired fugues to gnarled rock squalls and back again, with all of these winkling squiggles of color in between. There’s even a tasty deep-cut nugget for fans from his Yes years in the closing track “Wurm,” originally included as the final segment of “Starship Tooper” on 1970′sThe Yes Album. It’s interesting not just because the track dates to before Wakeman’s tenure in the band, but also in that the Steve Howe composition doesn’t end up as a showcase for guitarist Ant Glynne (a veteran of tours and sessions with Asia, Mike Oldfield, Slash, Carl Palmer, Mavis Staples and Simon Phillips), so much as the young percussive bassist Lee Pomeroy — who performs with a thrumming power. Wakeman lets that unspool for awhile, before eventually powering his way to the fore with an expansive solo full of soaring runs. These important assists from the New English Rock Ensemble, with whom Wakeman has been scheduling dates again for this summer, give In the Nick of Time a complexity that swerves well away from the baroque caricature: “Cathedral” includes a thunderous chorus, and a churchy organ turn from Wakeman to boot. Meanwhile, there is a diaphanous classical feel to “Dance of a Thousand Lights,” originally found on Wakeman’s 1999 concept album Return To The Centre Of The Earth. “White Rock,” the title song from a 1977 soundtrack, retains the original’s intricate amiability. It’s not a perfect record. For instance, I have never found a way to like Holt — an often brittle, bombastic vocalist — as much as Wakeman so clearly does. That’s a small thing, however, on a project with so many sweeping delights. In the Nick of Time ends up as a tour de force reminder of the talent that always girded Rick Wakeman’s legend, with or without the cape. STYLE: Progressive rock electronica.In The Nick Of Time is a live album recorded back in 2003 that showcases some of the outstanding solo material composed over the decades by keyboard legend Rick Wakeman. Supported by The New English Rock Ensemble, Rick's music here takes on a massive live rock character. The drums are thunderous, the lead breaks (both from Rick on synths and Ant Glynnes on guitar) are masterful and grandiose, the vocals are those of dramatic rock opera epics and even bassist Lee Pomeroy gets to dazzle during a blinding spotlight section of the concluding Wurm. The heaving progressive pomp and unashamedly extravagant arrangements give the music a dynamic enormity firmly rooted back in the seventies. In The Nick Of Time is a jewelcase presentation with a generous twenty page booklet included. The Front cover sets a galactic tone that is expanded throughout the package with effulgent red orange nebulae vomiting out stars, planets and snaking keyboard ribbons. Rick's image hangs in the void to one side of the titles semi-transparent. Track titles are listed with times on the rear along with publishing information. The booklet opens with a five page section "Rick's Attempt at a Definition" wherein Rick explains the title of the album; thoughts on prog; something of his personal history: a bit of a rant about Yes and The Rock and Roll Hall of Fame and plenty of thoughts on the development of the man's music. There are numerous live performance photographs, posters, biographies of the band and a whole page of credits and thank yous. Rick Wakeman is surely one of the most well known keyboardists alive - his work with various rock and pop giants (David Bowie, Marc Bolan and Yes) as well as some huge early solo releases (The Six Wives of Henry VIII, Journey To The Centre Of The Earth ...) establishing a loyal following that would remain for decades. In The Nick Of Time is an archival live recording that sees the maestro in fine form back in 2003 promoting the Out There album. Tracks include developments of favourite solo compositions such Catherine Parr/Beware Your Enemies and White Rock; pieces written for vocals such as No Earthly Connection; a reimagining of the Yes classic Wurm as well as pieces from the then newly released Out There album of 2003. For more information you can visit the official Rick Wakeman website or you can purchase the album directly from the Gonzo Multimedia website. British keyboardist reached legendary status in the 1970s for his work in British progressive rock band Yes and also for his early thematic solo albums. In The Nick Of Time – Live in 2003 is the latest release in his long career. It is a series of live performances recorded in 2003. In The Nick Of Time shows that in 2003 Rick Wakeman was still one the finest rock keyboardists. The album begins with a spectacular medley of two of his pieces, Catherine Parr and Beware Your Enemies. It is an outstanding keyboard fest, with Wakeman showing his masterful ability on synthesizers and organ. The next piece is ‘Out There’ from his Out There album released in 2003. Instead of a progressive rock piece, it sounds like Rick Wakeman jamming with Deep Purple. Next, he plays material from No Earthly Connection. The best part of this piece is Art Glynne’s guitar solo and a brief keyboard solo by Wakeman. Honestly, Rick Wakeman is at its best in instrumental parts. He hasn’t had much luck with solo vocalists. Another highlight is the beautiful symphonic composition ‘Dance of a Thousand Lights’ featuring Wakeman on a variety of keyboards. It’s a track from “Return to the Centre of the Earth” that was released in 2009. Rick Wakeman was well known for his use of cathedral style organ in various Yes albums. He shows his admirable technique in ‘The Cathedral on the Sky’. The solo vocals once more seem more appropriate for a hard rock band than for one of the legendary figures of progressive rock. ‘White Rock’ is a series of keyboard and guitar jams set to a basic rock rhythm. The album ends with ‘Wurm’ which is a Steve Howe piece from Yes’ classic song ‘Starship Trooper’ (part of the Yes album). This is the piece where bassist Lee Pomeroy shows his commendable skill with excellent bass lines. In The Nick Of Time – Live in 2003 is a fantastic live sampler of Rick Wakeman’s musical career. The progressive rock legend clearly demonstrates that he is at his best when he sticks to progressive rock material. 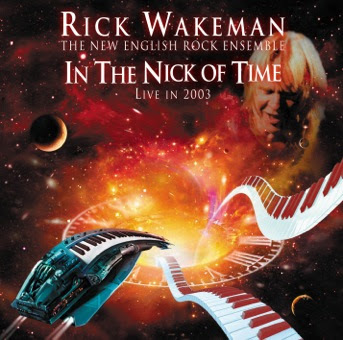 In the Nick of Time-Live in 2003 is the brand new live release from former Yes keyboard legend Rick Wakeman and The New English Rock Ensemble, which features Ashley Holt (Vocals), Tony Fernandez (Drums), Ant Glynne (Guitar), and Lee Pomeroy (Bass). Though the recording is now 9 years old (from the tour that promoted Wakeman's then new album Out There), it's finally seeing the light of day here in 2012 on Gonzo Multimedia. The songs are all taken from Wakeman's solo albums with the exception of "Wurm", which of course comes from The Yes Album. Fans of the keyboard virtuoso will no doubt be very familiar with most of the material on display here. Opening cut "Catherine Parr / Beware your enemies" is one of Wakeman's true classics of blazing, classical tinged symphonic rock, as his dizzying runs and melodies sound just as good as they did over 30 years ago, and Glynne's metal guitar style adds a real punch to this extended romp. Holt's theatrical vocals come into play on the hard rocking prog of "Out There", which again features some awesome keyboard and guitar histrionics. "No eartly connection" has an almost ELP feel to it, with Holt's soaring vocals matched with Wakeman's orchestral keyboards, as the two seem to be doing their best Emerson & Lake impression, while "Dance of a thousand lights" shows Rick's majesty on the piano. Gorgeous church organ and symphonic synths permeate the upbeat "The cathedral in the sky", and "White Rock" is a real Moog workout for Mr. Wakeman but also contains some white hot solos from Glynne and furious rhythms courtesy of Fernandez & Pomeroy. Yes fans will love the bands version of "Wurm", which is the closing instrumental part of "Starship Trooper", but be sure to listen closely for other quick snippets of classic Yes tunes as well on this one. Both Wakeman and Glynne go to town here on this blazing romp! Pretty exciting stuff from one of the worlds greatest keyboard players, and he's got a real hot band on this recording to help recreate some of these exciting songs. Seeing as Wakeman isn't part of the Yes machine any longer, let's hope he at least does something else with The New English Rock Ensemble again in the near future. This live album from Rick Wakeman is a powerful disc. It seems like it might not be a full concert, though. Still, we get a wide range of music here, finding Wakeman in the progressive rock bombast period more than anything else. It’s a great addition to his catalog. The Wakeman classic tune is presented in a cool live performance and Wakeman solos like crazy as we get into the second half of the “twofer.” This is really quite an awesome keyboard showcase that finds Wakeman in rare form. As this extended piece continues there’s some smoking hot guitar soloing, too. Here’s an epic length piece that features some killer prog instrumentation and vocals. It’s a dynamic and powerful number with a lot of different sections and moods. It can be very mellow and sedate at times, but also rocks out at other points. The vocals are among the strongest of the whole disc. While the cut certainly has some great keyboard performances, there are some inspired guitar solos, too. Bombastic and theatrical, this has a lot of the same musical characteristics as the last number. It’s a good piece of music and features more killer Wakeman soloing. Here we get a keyboard solo that works really well. It covers a lot of territory and has some great melodies and changes. With both female operatic vocals and male vocals in the mode of the theatrical meets rock sound found on the rest of the songs, this is a rocking tune with a lot of classical music in the mix. This instrumental is quintessential Wakeman and has some great soloing. Covering this Yes instrumental section, they bring some funk to the table through the killer bass line and there’s a lot more going on here, too. It’s a heck of a jam and a great way to end the concert and this live album in style. Rick Wakeman is known to prog rock fans as a cape-wearing keyboard maestro, who came to prominence as a member of Yes. In all the turbulent years during his various Yes stints he also nourished a respectable solo career, often criticised for being a bit too full of average moments. 2012 brings about another look into his past – a live album dating into the 2003 period. In the Nick of Time documents the performances in support of Wakeman’s Out There album. Wakeman is joined by his faithful New English Rock Ensemble, this time with Ashley Holt instead of Damian Wilson, who was the singer of choice on Out There. The album contains compositions you’d come to expect from Wakeman from his classic 70s albums. Of course, there are a few tracks from the Out There album, as he was promoting the album at the time and even some music from Return to the Centre of the Earth. It is for these rare live tracks that this album could be an enticing proposition for unadulterated synth fanatics. The band is in fine form, Wakeman’s synth sounds actually sound good and the choice of tracks is not too predictable. I’m not a fan of everything Wakeman has done, but this live album shows The New English Rock Ensemble in a wonderful light. All the guys are spectacular, with Wakeman delivering the biggest blows. Definitely a worthy document if you're a Wakeman fan. The playing is fierce throughout and especially Wakeman shines on this, with no cheese for miles around. A synth extravaganza for sure, but done in good taste. This review was made possible by the record label Gonzo Multimedia and Glass Onyon PR.